With big lighting vendors like Visual Comfort, Currey & Co., Urban Electric, and so many others populating design magazines with their fabulous and seemingly endless designs (there are SO many I’ve bookmarked to use someday! ), it can be easy to forget that vintage lighting can also be an option. 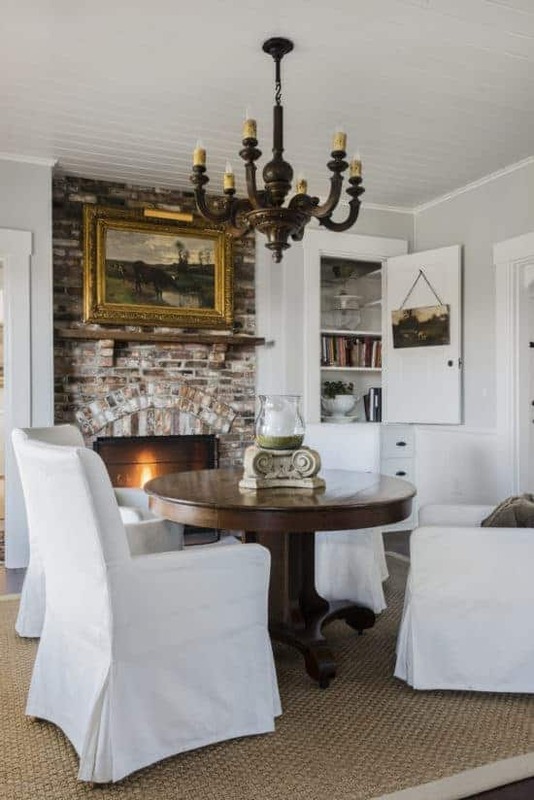 Sometimes vintage can be a cost-saving way to add character to your home. Sometimes it’s just as expensive as buying new, depending on the quality, unique character, and demand for a certain style. More elegant Murano chandeliers (not so much the floral kind), for example — good luck finding a deal on those outside of auctions! Designers have another reason for going for new lighting — quick and high quality search results from vendors = saving time and customers money when they are paying by the hour. So buying new vs. looking forever for the perfect vintage light could come out to be a tie when cost is concerned in that case. I first discovered The Big Chandelier when I was doing my post on timeless Shaker kitchen style for both the Saturday Blog and New Hampshire Magazine. In those articles, I featured Joan of fortheloveofahouse‘s wonderful kitchen. Joan found her vintage French carved wood kitchen chandelier at Brimfield. I had difficulty finding something similar online when I was trying to do a “Get the Look” for her kitchen (see sources here). All the new wooden chandeliers I found either looked cheap or cost a fortune. Then I found the one I included here. The Big Chandelier has been sourcing its lighting from Europe since 1989. Owners Jack and Ellen Prestia go on buying trips all over the continent 3-4 times a year to gather their inventory from long-time vendors not available to the general public, and most not even open to the “design tours” that have become popular in recent years. Jack and Ellen on a buying trip in Brussels. About 1/3 of their clientele are designers (Suzanne Kasler has been known to come into the store with her sketch pad when searching for inspiration for her collection for Visual Comfort) and the rest are private buyers looking to source lighting for their own homes. Jack admits that TBC’s warehouse of chandeliers, most not yet restored, can be pretty intimidating to the private buyer. You really need to have some vision to picture an “after” image of a potential product sometimes. The website for The Big Chandelier is great, with 9 web pages of chandeliers for your perusing pleasure. However, the company’s website says that it has 10,000 square feet of inventory at its store in Atlanta. That’s a lot of space to fill with antique lighting! I knew I had to visit. The Handsome Husband’s family lives about 80 miles from Atlanta, so on our recent family trip, I finagled an excursion to the Georgia Aquarium (a favorite with the boys) in the city so that I could hit The Big Chandelier on the way home. There are two floors and a number of rooms full of chandeliers of every size, from petite boudoir ones to big iron chandeliers 7 feet tall. I’m sorry — my pictures are singularly horrible. I had roughly 20 minutes to run in, get an impression, talk to the owners, and skedaddle back to the car where Things 1 & 2 were finishing up lunch before we booked it back to my in-laws’ house. Plus, lighted chandeliers (and rooms with enormous windows with broad daylight streaming in) are hard to photograph. I just want to give you an idea of the scope of the inventory. I have a feeling Joan would go nuts in The Big Chandelier. It has a particularly impressive variety of antique iron chandeliers, just like Joan has in her barn room. Some of them are bigger than I am. This one is about 7 ft. tall. Do you have one of those awkward double-height rooms? This is what you need. How about a matching pair? I scooped the below Murano chandelier up for a client before the store had a chance to put in on the website. Including restoration, cleaning, and replacing the candle sleeves, TBC’s price was $800 (not including a designer discount). Looks an awful lot like this one (same size) from 1st Dibs. Some more that caught my eye that aren’t on the website. Again, sorry for the awful pics. This one is ADORABLE!!! Not vintage. This was a new floor sample. 23″ w x 26″ H for $750. I keep trying to think of a place I could use it in my house, but I’m just out of space. Pair of antique copper hanging lanterns, $950. This is actually a single chandelier with three forged lanterns hanging down. In my haste, I cropped the top off the pic. This would be amazing over a dining table or in a great room with rustic wood beams. A real antler chandelier. Hard to find these days. TBC has an array of vintage Spanish sunburst flush mounts. The store does all refurbishment and glass replacement. I’ve forgotten the prices, but I know the above smaller ones were well under $500. Again, compared to the offerings on 1st Dibs…. I had to include this crystal and glass chandelier. It’s like mine, but on steroids. It’s 7 feet tall. Because of that, I can understand the $7,500 price tag, can’t you? Another Murano beauty. TBC will clean it, restore it, and then carefully disassemble it for shipping and send pictures and directions for reassembly. This one, at 45″ wide and 25″ high is $1,750. Cool brass pendant, 18″ x 18″ for $800. This would look great over a game table. Pretty little New England onion-shaped smoke bell lantern, 10″ x 16,” $450. This would be lovely over a kitchen sink or in a small entry. Some of TBC’s work in situ…. Restoration is done onsite by TBC’s meticulous team. How cool is that waffled pendant she’s working on?! As I said, the website does have a pretty fantastic selection. The iron and wood chandeliers are very reasonably priced. The crystal ones get up above $1K, but that’s to be expected, unless you find them yourself at the Paris Flea Market and then single handedly do the restoration work. Here are some of my favorites. 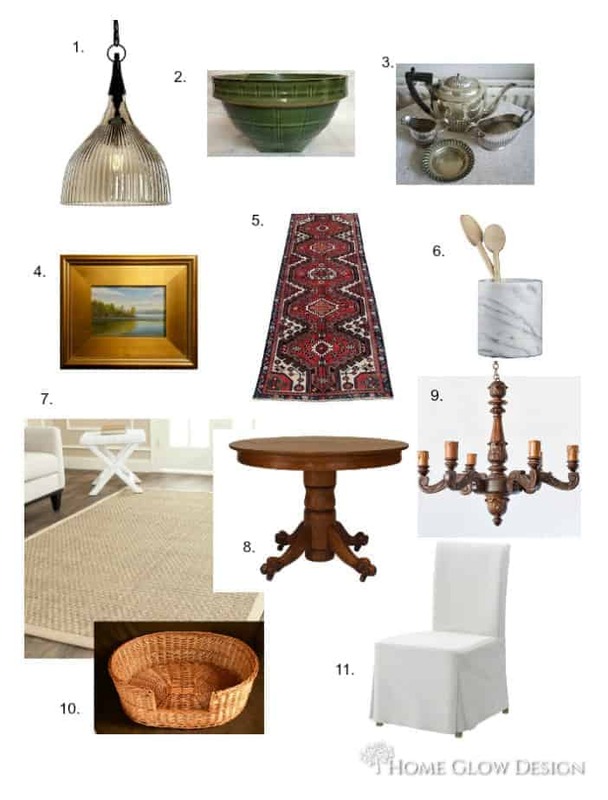 Tell me, doesn’t this look a whole lot like Suzanne Kasler’s Ré Flush Mount????? Here’s a little graphic that you can pin for your reference! I’m signing off for a couple of weeks to spend some quality time with the husband and kiddos. Hope I don’t lose you! I’ll be back on the 22nd.